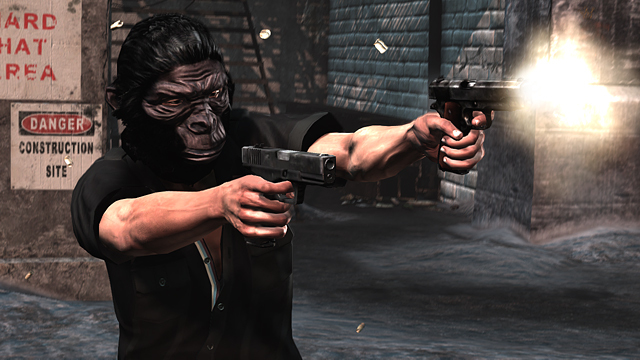 Gorilla Mask - Extra adrenaline for every melee kill. Lucky Coin - Extra cash for every body you loot. Booby Trap - Your corpse explodes upon being looted by another player. As well as this free DLC, we are now able to purchase the Rockstar Pass on Xbox Live and PlayStation Network, which will give you access to all of Max Payne 3's DLC for a lower one-time price, including the Local Justice Map Pack which will be arriving next month. What do you think of the free DLC Rockstar is giving? Let us know in the forums! So these all three items are something we can equip, not Bursts? Great for newbies and I love that Booby Trap. So these all three items are something we can equip, not Bursts? Pretty sure that's what it is. That made me laugh, that skin Pretty cool stuff, and it's for free, great! Though I wonder why this pack does cost � 1.49 at the PS Store (UK). Must be an issue I think. This looks nice, gonna see if I can hop on tomorrow. Unfortunatley it didn't come today, hopefully it should come on the release day. I only use the coin for cash. The booby trap is easily countered since the goggles are the best item you can have in the beginning and the mask ruines the look of my character and I don't really do melee that much. Yeah, when you equip them, all booby trapped bodies are glowing red. Local Justice DLC Coming Soon! Check out our selection of high quality screenshots from Max Payne 3. What system will you play Max Payne 3 on? © 2009-2019 PayneKillers and Dom Fiore. Coding and design by Chris Phillips. All rights reserved.